Congrats to former Masters student and WELL project team member Destini Petitt on publication of her thesis research conducted as part of the WELL project. Destini’s study explored how undergraduate students from developing and developed countries leveraged their values to reason about socio-hydrological issues. Published in Natural Sciences Education, the article illustrates students’ priority values, alignment between these priority values and their proposed solutions to water-related challenges, as well as similarities and differences in both between the two groups of students. We wish Destini the best of luck in her doctoral work in the Dept. of Geography and Earth Sciences at the University of North Carolina-Charlotte! This entry was posted in Research, Teaching and tagged GER, postsecondary, SCIL 101, undergraduate, water, WELL on February 15, 2019 by corytforbes. The CliMES team is excited to share our first project publication, which appears in the December issue of the Green Schools Catalyst Quarterly, a publication of the Green Schools National Network. In this article, we provide an overview of the CliMES project, as well as a primer on the findings from the literature review in which we are currently engaged focused on K-16 climate education. 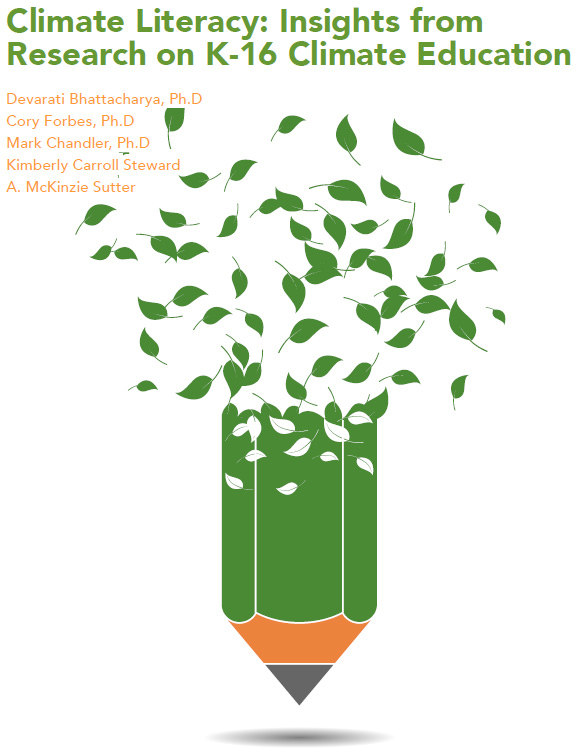 This issue, entitled Climate Literacy: Educating with the Future in Mind, focuses on climate education and includes contributions from an array of esteemed science education colleagues, including some of our CliMES project advisory board members. We very much appreciate the opportunity to contribute to this important issue and the broader conversation about climate education in K-12 classrooms. This entry was posted in Research, Teaching and tagged climate, CliMES, geoscience, GER, Graduate, secondary science on January 9, 2019 by corytforbes. Congrats to Diane Lally, doctoral student with the WELL project, for being selected by the National Association of Geoscience Teachers (NAGT) for a 2019 Outstanding Teaching Assistant Award. This award recognizes outstanding teaching assistants in geoscience education. Diane is currently a 4th-year doctoral student who, for the past 3 years, has served as a graduate teaching assistant for the SCIL 109: Water in Society course. Her research focuses on scientific modeling and systems thinking in undergraduate geoscience courses, including work in the 109 course develop and study the impact of course modules in which students use data-driven, computer-based water models to investigate water-related phenomena (e.g., groundwater, regional water balance, etc.). This entry was posted in Research, Teaching and tagged geoscience, GER, NAGT, postsecondary, SCIL 109, undergraduate, water, WELL on January 4, 2019 by corytforbes. This past week I traveled to Kiel, Germany, to begin work on my Fulbright-related research. This work focuses on data from the 2015 administration of the The Programme for International Student Assessment (PISA), in which 28 million 15-year-old (secondary) students in 72 countries completed the PISA. In 2015, the focus of the PISA was science, with approximately half of the assessment devoted to science items. We are exploring observed relationships between student achievement as related to scientific literacy outcomes and reported instructional practices of high school science teachers. 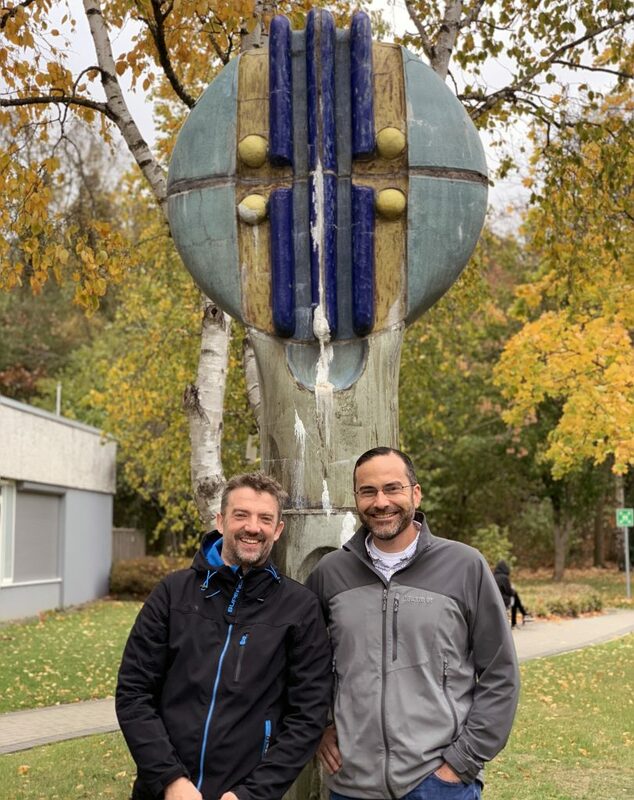 A special thanks to Knut Nuemann for hosting me at the IPN Leibniz Institute for Science and Mathematics Education at the University of Kiel and to and Anja Schiepe-Tiska, from the Centre for International Student Assessment (ZIB) at the Technical University of Munich (TUM), for traveling to Kiel for a few days to work with us. I very much look forward to the ongoing collaboration on this important work. This entry was posted in Research, Teaching and tagged Fulbright, Germany, inquiry, PISA, secondary science, secondary teachers on October 30, 2018 by corytforbes. Many thanks to the National Association of Geoscience Teachers (NAGT) Geoscience Education Research (GER) Division for showcasing our research and development work in the October, 2018 Geoscience Education Research Spotlight. Through funding from NSF and USDA-NIFA, we are fortunate to be able to implement a number of geoscience-focused education research and development projects in a variety of educational settings, including K-12 and undergraduate classrooms, as well as professional development for K-12 science teachers and postsecondary faculty. It is wonderful to have had the opportunity to build a connection with the NAGT GER community in recent years. I look forward to continuing to contribute to this community, as well as the positive impact this connection will have on our own project work. This entry was posted in Research, Teaching and tagged CliMES, geoscience, GER, MoHSES, NAGT, WELL, WELS2 on October 19, 2018 by corytforbes. An article describing our NSF-funded SCIL 109 Water in Society course, part of the WELL project, and its first implementation appears in the September/October 2018 issue of the Journal of College Science Teaching. In the article, we describe core tenets of the course design, present some findings from research conducted during the first year of the course, and share some ongoing questions and challenges associated with the course. This was a great team effort and it’s fantastic to see this manuscript in print. We look forward to building on this work with subsequent publications focused on students’ model-based reasoning about socio-hydrologic issues conducted in the context of the course. This entry was posted in Research, Teaching and tagged CASNR, geoscience, GER, NSF, postsecondary, School of Natural Resources, SCIL 109, undergraduate, water, WELL on September 5, 2018 by corytforbes. 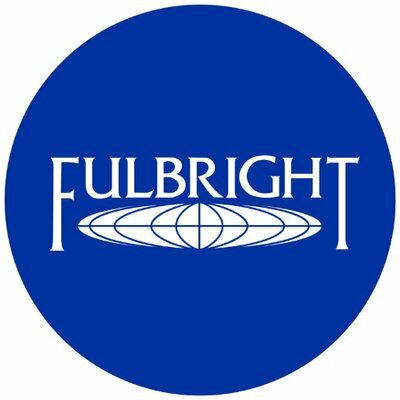 I am delighted and honored to have been named a 2018-2019 Fulbright Scholar. Through the generous support of a Core Fulbright U.S. Scholar Grant, I will travel to Germany in the upcoming 2 years to collaborate with researchers at the IPN Leibniz Institute for Science and Mathematics Education at the University of Kiel and the Centre for International Student Assessment (ZIB) at the Technical University of Munich (TUM), Germany, to conduct analyses on data from the 2015 administration of the The Programme for International Student Assessment (PISA). As an integrated research/teaching project, I will not only have the opportunity to conduct PISA-focused research, but also engage in graduate and undergraduate teaching at one or both institutions. This is truly a once-in-a-lifetime experience, both professional and personal, and I am grateful for the support of the Fulbright Program and the German-American Fulbright Commission. A special thanks to Knut Nuemann and Anja Schiepe-Tiska, as well as colleagues and administrators at the University of Nebraska-Lincoln, for paving the way for me to pursue this work. This entry was posted in Research, Teaching and tagged Fulbright, Germany, PISA, secondary science, secondary teachers on August 30, 2018 by corytforbes. 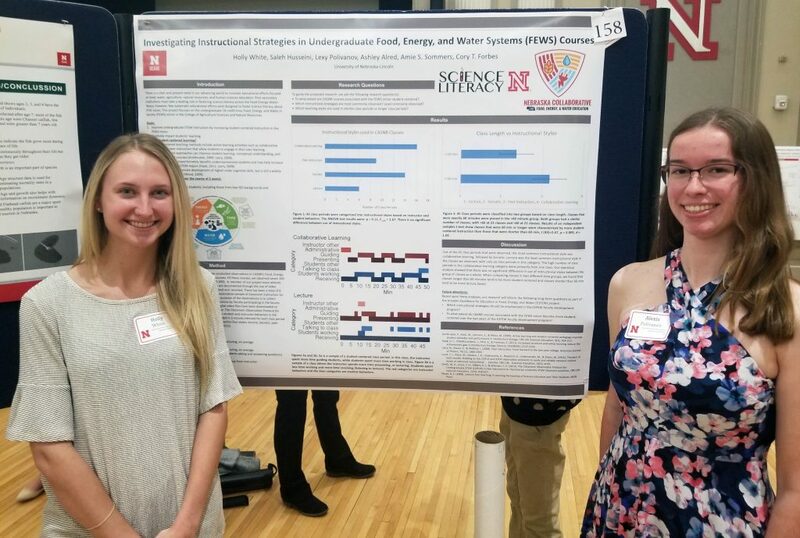 This past year, the E2FEW project has benefited tremendously from contributions of undergraduate research assistants supported through UNL’s Undergraduate Creative Activities and Research Experience (UCARE) program. Over the course of the past 12 months, the UCARE program has funded 4 undergraduate students to collect and analyze data, as well as disseminate project activities and research findings, in collaboration with the E2FEW project team. 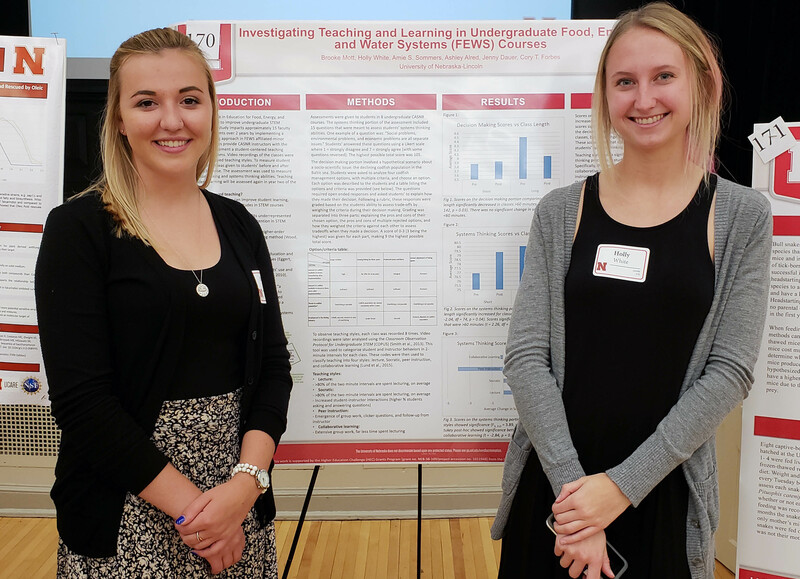 We are very thankful for the hard work of Holly White, Brooke Mott, Lexy Polivanov, and Saleh Husseini to videorecord CASNR classes, score student work, run stats, and develop posters for sharing our project work with the UNL community. We look forward to Holly and Brooke continuing their work this year as part of the E2FEW project team and Forbes group! This entry was posted in Research, Teaching and tagged CASNR, E2FEW, postsecondary, professional development, SCIL 101, SCIL 109, undergraduate on August 11, 2018 by corytforbes. This summer, the Forbes team attended and presented at the 2018 Earth Educators’ Rendezvous on the campus of the University of Kansas in Lawrence, KS. As part of the conference, I had the unique opportunity to co-plan and co-facilitate a 3-day workshop – Advancing Transdisciplinary Dialogue in Geoscience Education Research – with my colleague Caitlin Callahan. The objective of the workshop was to advance research around grand challenges associated with teaching about the Earth in the context of societal issues. Attended by nearly 40 participants, the workshop was highly engaging for all involved. Many thanks to our participants and invited speakers: Laura Zangori, Anne Egger, Steve Semken, and Donna Charlevoix. The Rendezvous also afforded the opportunity to present work from the WELL project and NC-FEW. It was wonderful to engage with the geoscience education community and spend time on the KU campus. As always, Rock Chalk, Jayhawk! This entry was posted in Leadership, Research and tagged EER, geoscience, GER, NAGT, NC-FEW, WELL on July 30, 2018 by corytforbes. For the past year, I have been fortunate to be involved in an NSF-funded endeavor to identify and articulate grand challenges driving geoscience education research in the years to come. The resulting product is a community framework for geoscience education research, which is freely-accessible to anyone with interests in this domain. I served on a working group for one of the 10 strands focused on teaching about the Earth in the context of societal issues, a summary of which can be found in published form here. Many thanks to Kristen St. John and the other PIs for leading this effort! This entry was posted in Research and tagged geoscience, GER, NAGT, NSF on July 2, 2018 by corytforbes.